Colored Orphan Asylum (Oxford, N.C.) Annual Report of the Colored Orphan Asylum Located at Oxford, North Carolina from December 1, 1908, to December 1, 1909. 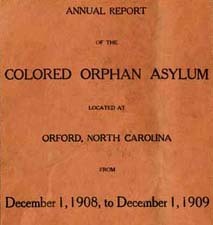 Annual Report of the Colored Orphan Asylum Located at Oxford, North Carolina from December 1, 1908, to December 1, 1909. Oxford, N.C.: The Asylum, 1910. African American children -- Institutional care -- North Carolina. Orphanages -- North Carolina -- Oxford.